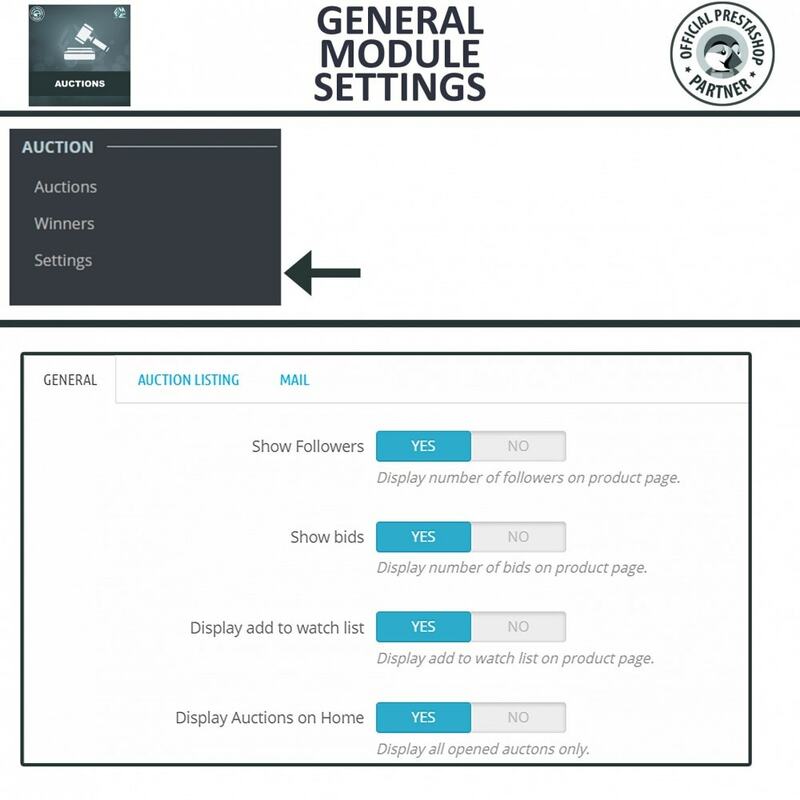 Option to have an "Add to Cart Price"
PrestaShop Auction module by FME allows retailers to initiate auctions, set maximum and minimum price, time limitation and adjust auction setting whenever they please. 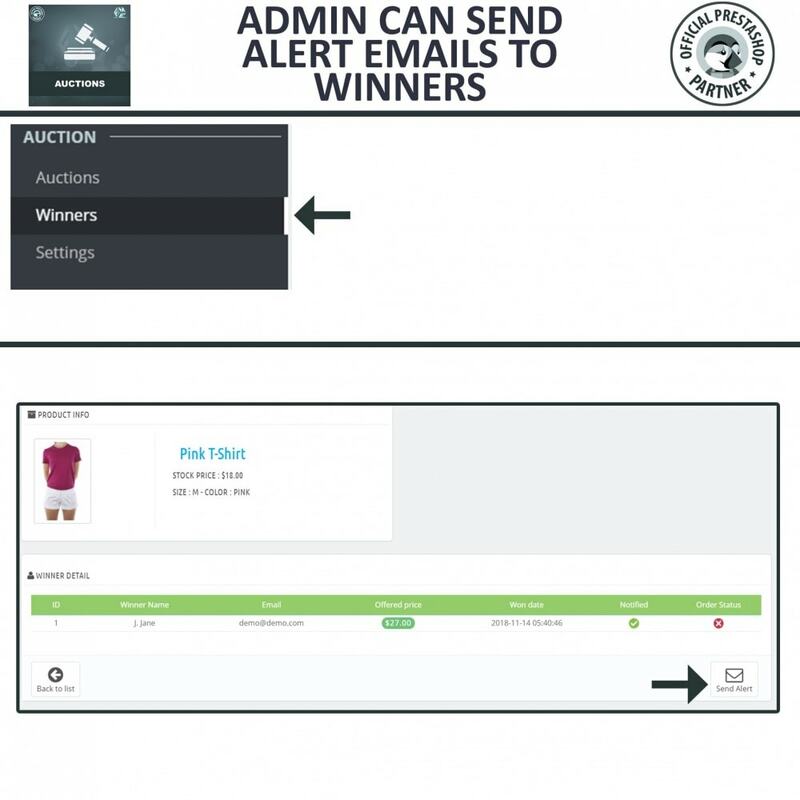 Alerts are automatically channeled to all the customers who place bids when a stronger bid is made on a product. 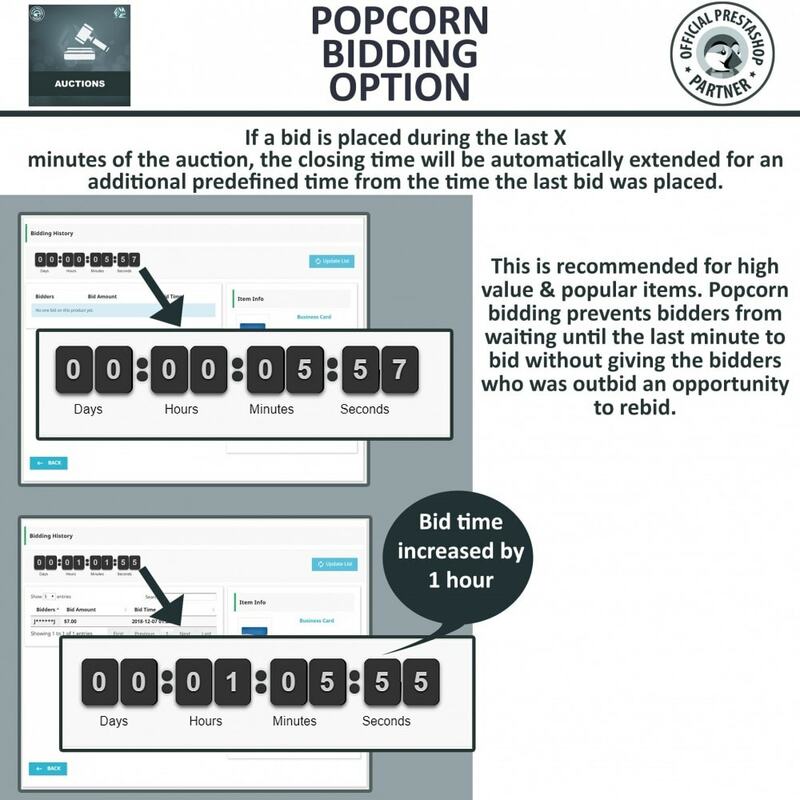 Bid winners are alerted through notifications when the auction time is complete. Customers have the liberty to open their bid history and track their status. 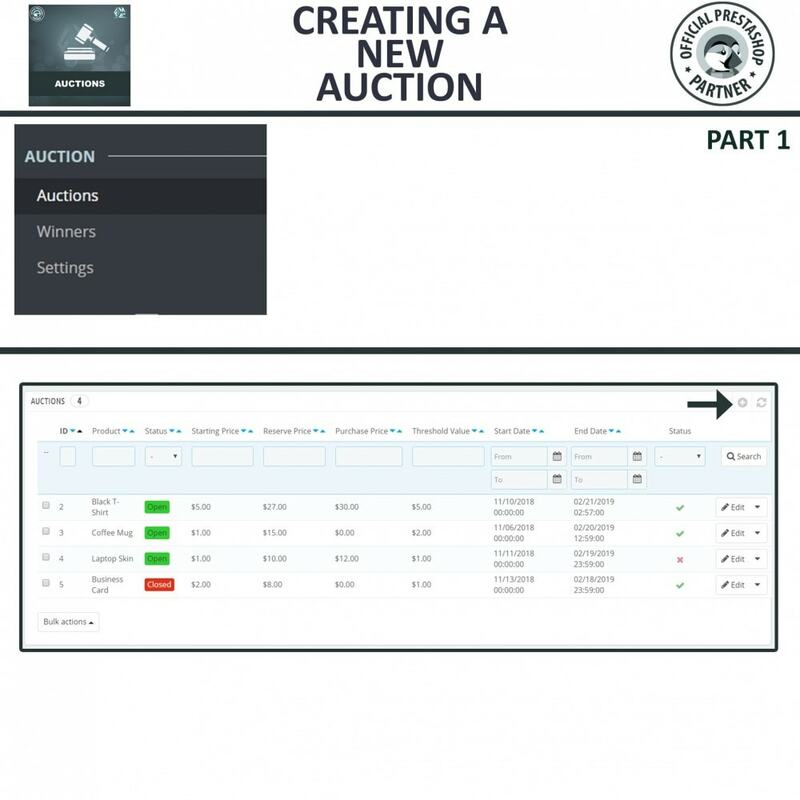 The back office can be accessed by the admin to supervise auctions and bids on total discretion. 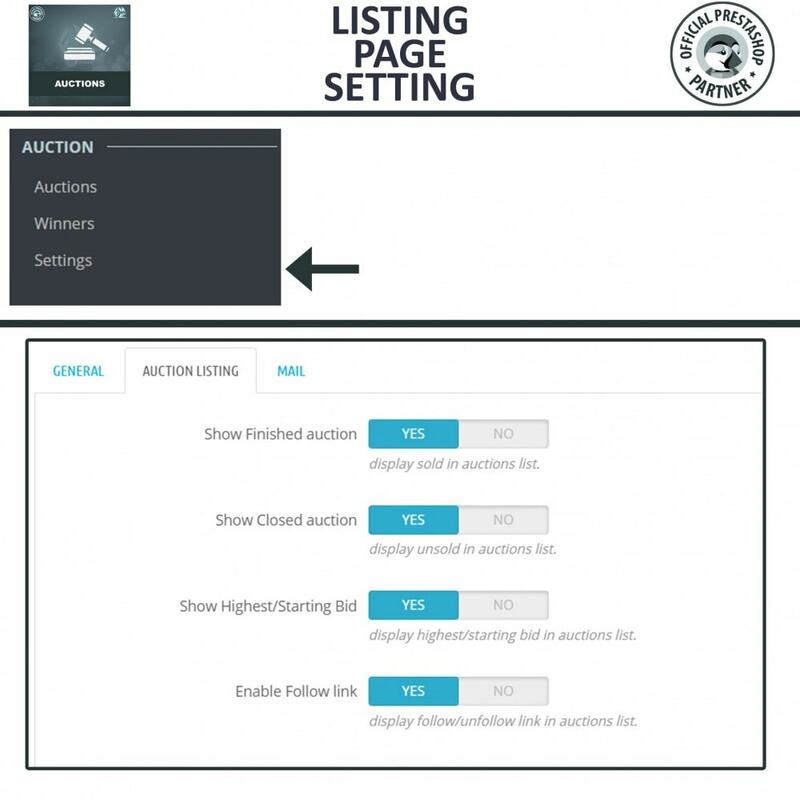 Admin can also set the bid as valid or flag it as invalid while accessing the back office and view auction summary. Bid history and other details are also shown. 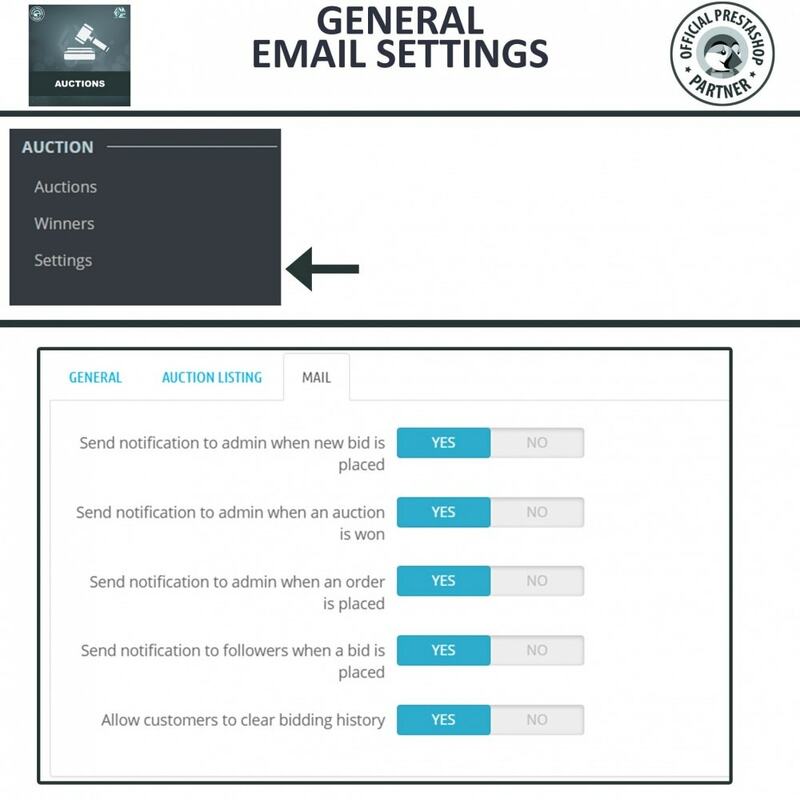 For initiating auctions, supervising bids and tracking winners from the backend, three distinct sections are offered. DEMO shows more details. 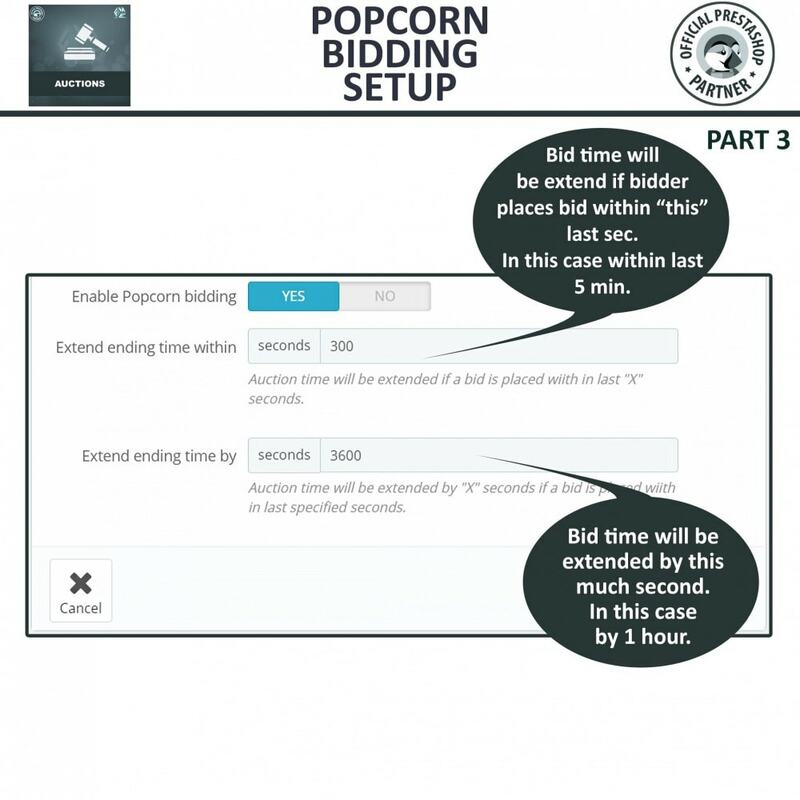 Auctions based on combination and simple formats are supported. 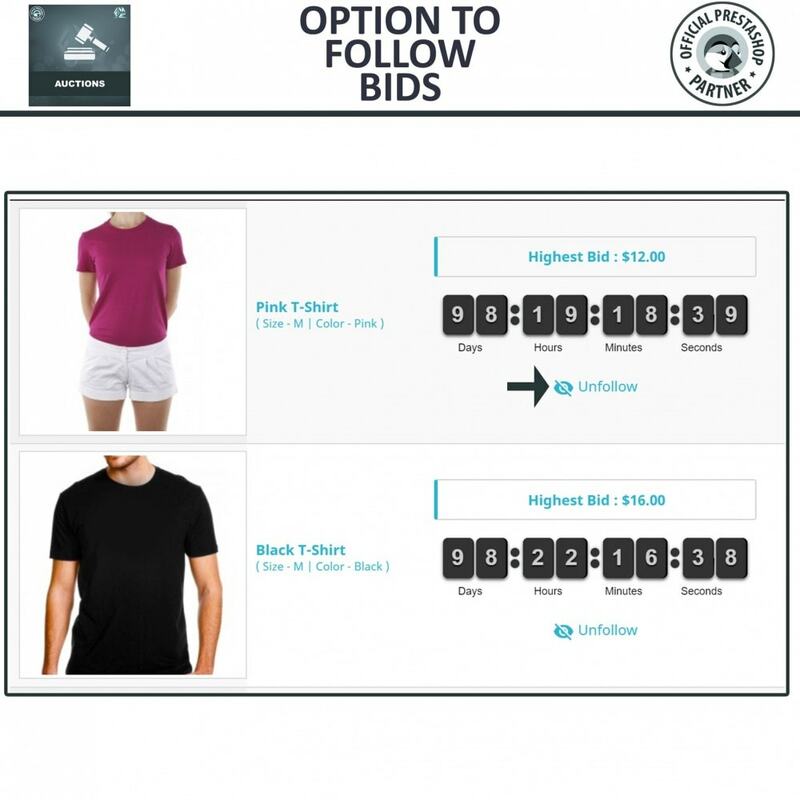 Following and bidding is allowed for logged in customers. 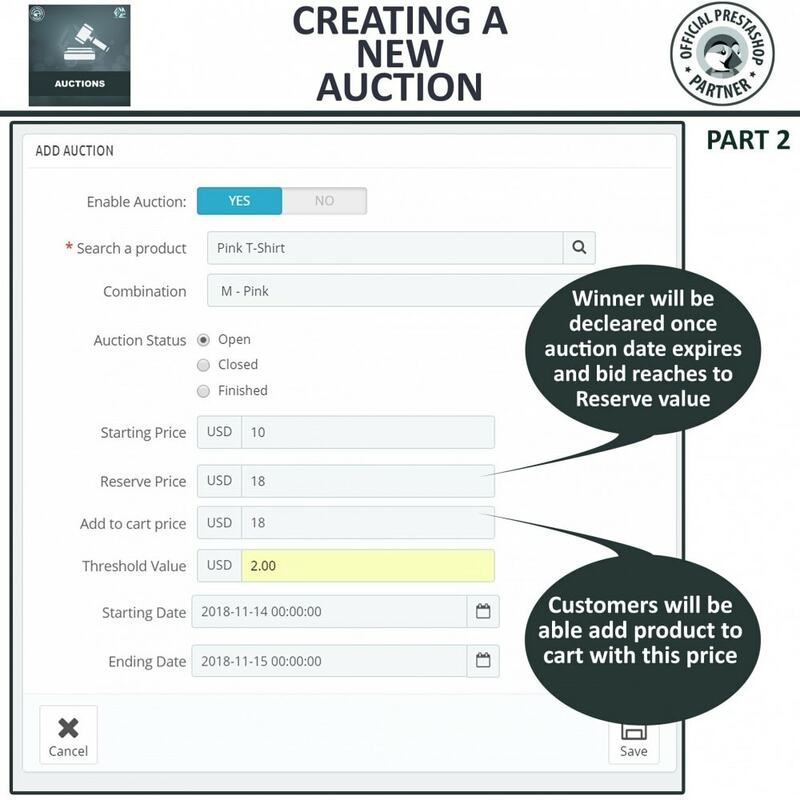 Customers can access different sections from their accounts such as ‘bid history’, ‘won auction’ and ‘watch list’. Orders can be placed through product page of Winners accounts. Added SOLD and CLOSED auction labels for customers / bidders. Add cron job to delete products of finished auctions after a specific time. 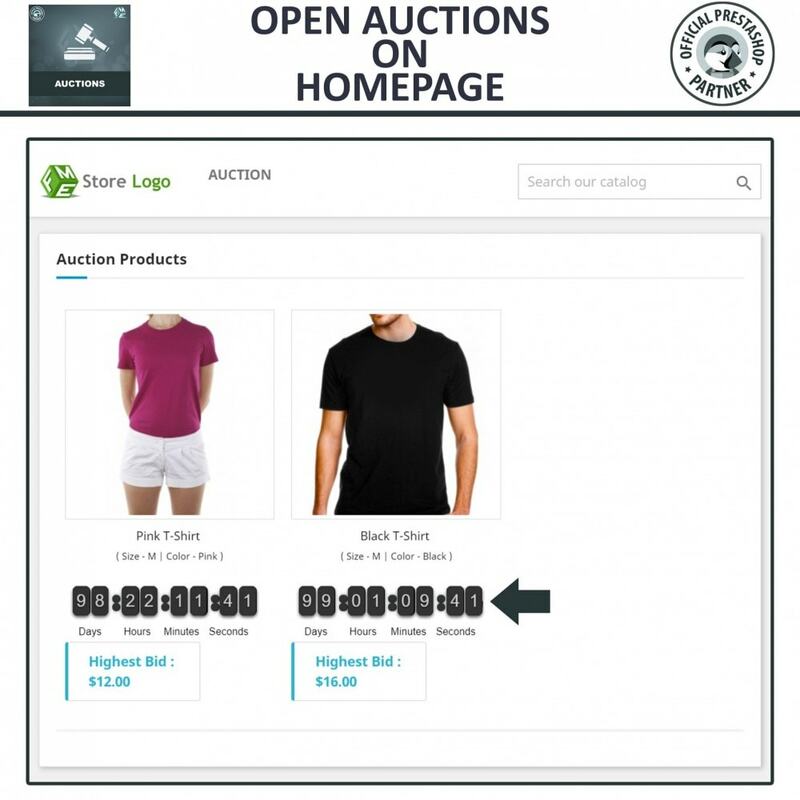 Option to have an Add to cart Price – Instead of going through the auction process, customer can pay a price to buy product instantly. New Feature: Add cron job to delete products of finished auctions after a specific time.